For the E2 region and most of late genes, use pAd1128 or one of its derivatives. For the E3 region and fiber gene, use pAd1129 or one of its derivatives. For the E4 region, use pAd1130 or one of its derivatives. 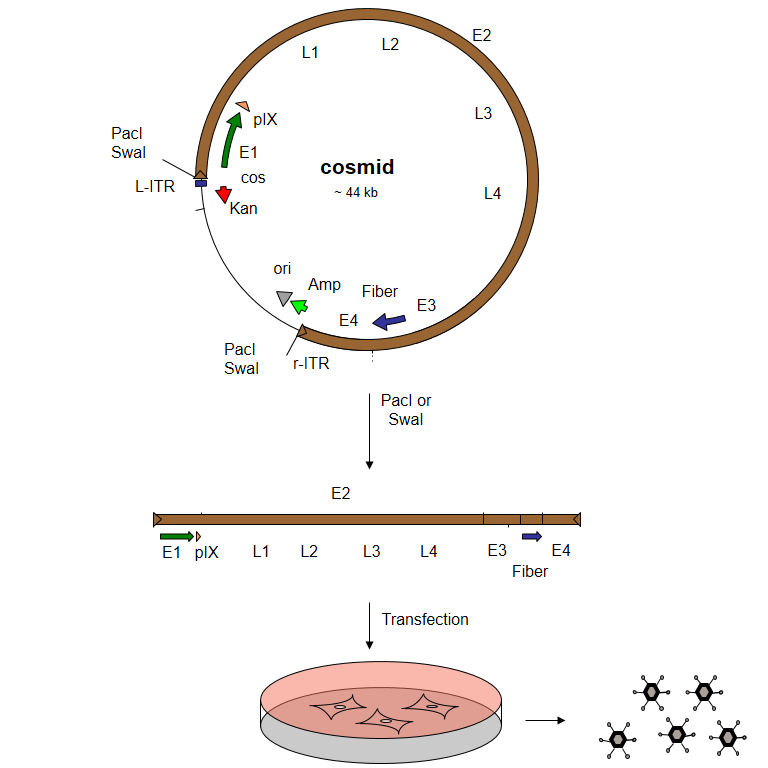 Step 2: Reconstitute the entire sequence of your recombinant virus by assembling the 4 shuttle plasmids into a cosmid. Step 3: Linearize the cosmid DNA and transfect it into helper cells to recover the virus. Use our Vector Selection Tool to determine which plasmid is most suitable for your application. Modify one or several of the 4 shuttle plasmids (pAd1127 - pAd1128 - pAd1129 -pAd1130) or their derivatives. 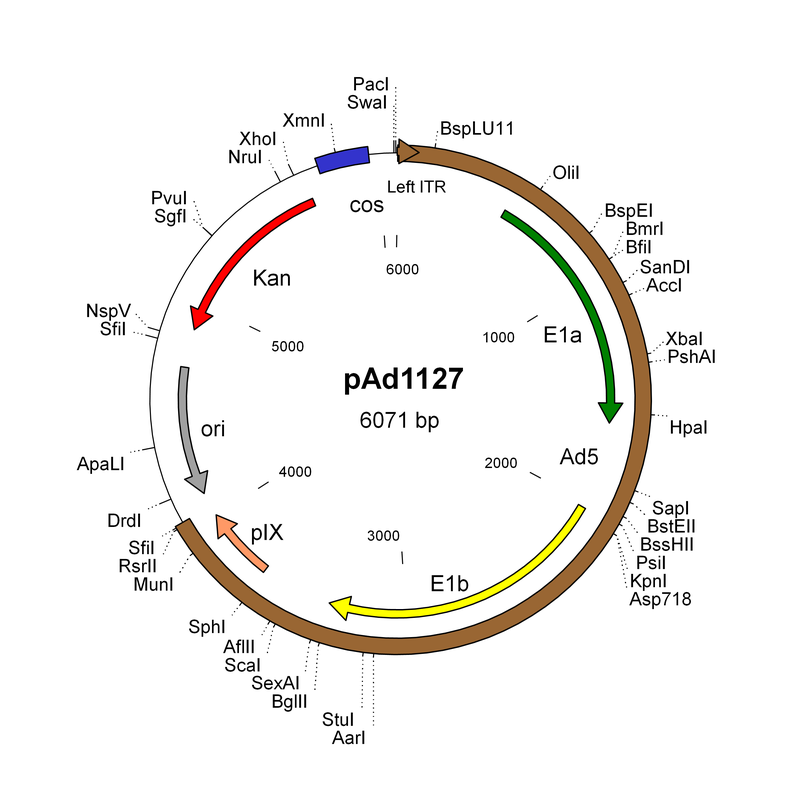 pAd1127 contains the Ad5 left ITR, packaging signal, the E1a and E1b regions, and the pIX coding sequence. pAd1128 contains the E2 region (DNA polymerase, terminal protein, DNA-binding protein) and many of the late genes. pAd1129 contains the E3 region and fiber gene. pAd1130 contains the E4 region and right ITR. 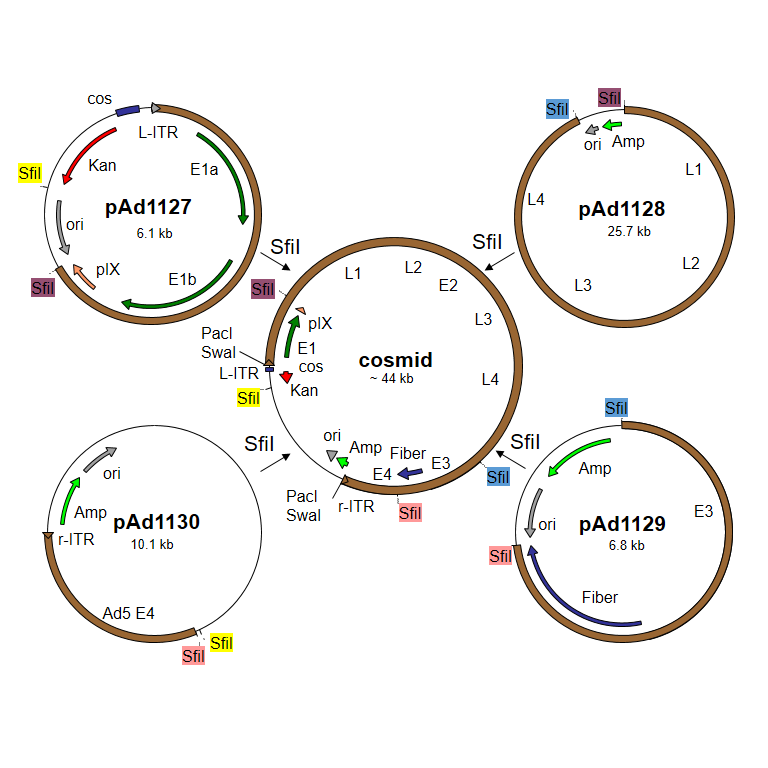 Digest the 4 shuttle plasmids with SfiI, and ligate them to each other. The purification of DNA fragments on agarose gel is not necessary. The following is an up-to-date list of the shuttle plasmids pAd1127, pAd1128, pAd1129, and pAd1130, and their derivatives. Please use our Vector Selection tool to find the plasmid that best suits your needs. The cosmid technology that our system uses is particularly well suited for the cloning of the 36 kb-long adenovirus genome in E coli. Because phage lambda packages DNAs ranging from 39 to 54 kb, the cloning method selects bacterial clones containing full-size adenovirus genomes. There is no danger for an unpredicted recombination in E. coli that would not be detected by restriction analysis and would cause the DNA to be non-infectious. There is no need for the transformation of a recA+ strain (e.g.. BJ5183) for the recombination and the subsequent transfer to a recA endA strain for plasmid preparation. Phage lambda infection can be performed directly into recA endA strains such a DH5a, XL-1 blue or Top10. Expression cassettes are linked to a bacterial positive-selection markers (Kanamycin-resistance gene or lambda cos site). Therefore their presence is ensured in the resulting construct. Please note that the Kanamycin-resistance gene is not inserted into the recombinant Ad genome. The SfiI restriction sites used in the procedure generate non-symmetrical cohesive ends suitable for directional cloning. The cosmid construction via packaging into phage lambda generally produces hundreds of clones, with ~ 100% efficiency. The cosmid construction by electroporation is about 70% efficient. Up to 3 µg cosmid DNA per mL bacterial culture can be obtained. The 4 shuttle plasmids can be modified independently from each other, then assembled together in a single cloning step. Plaques usually appear 7 to 10 days after transfection, sometimes as early as 4 days. Each of the 4 shuttle plasmids comes in a growing number of versions. The result is several hundred possible configurations for your recombinant virus. Two rare-cutting enzymes (PacI and SwaI) are available to linearize the cosmid before transfection into helper cells. Therefore, this method is likely to be useful in a very large number of applications. Compared to other techniques that also reconstitute the entire sequence of the recombinant virus in plasmid, AdenoQuick requires less “hands-on” time: given the very high percentage of correct clones obtained using the cosmid system (~100 %), only a limited number of clones needs to be analyzed at small scale (mini preps). E1-substituted adenovirus vectors, the classical expression adenovirus vector wherein an expression cassette of interest replaces the E1 region. E3-substituted adenovirus vectors. This type of vector can be used to avoid the emergence of replication-competent adenoviruses (RCA) during virus amplification in 293 cells. The expression cassette of interest is inserted into the E3 region, while the E1 region is kept empty. If necessary the size of the vector is brought to about 36 kb using stuffer DNA. If the viral vector recombines with the WT E1 region inserted into the 293 cell chromosome, a viral genome will be generated, which will be too long to be packaged, and will not generate viral particles. Please note that there are some restrictions about the nature of the expression cassette that can be inserted into the E3 region. E1/E3/E4-deleted adenovirus vectors, with expression cassettes in the E1 or the E3 regions, or both. Oncolytic conditionally-replicative adenovirus vectors (CRAd's), wherein a cell-specific promoter drives the expression of E1a, so that the virus replicates only in that cell type. Additional transgenes ("therapeutic", killer, reporter genes) can be inserted in other regions of the virus such as E3.